The death of Aidan Fuller on 8th April 1973 occurred only a few weeks before the Society's Annual General Meeting. At that meeting there was unanimous approval of a resolution to honour him as a founder member, former Hon Treasurer, Secretary and, later, Chairman of the Society by the creation of a permanent tribute to his memory. Subsequently the Committee decided that this should take the form of a trophy to be awarded annually to the winner of a photographic competition. For the trophy itself a departure from the traditional silver cup was made in favour of something more in keeping with the hobby that brings us together, and probably as intrinsically valuable - an industrial locomotive maker's plate, suitably mounted on a wooden plaque. 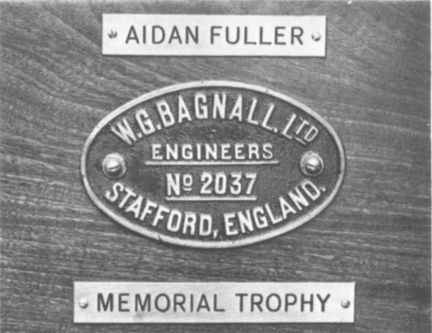 Our member Ray Fox undertook to make the trophy and provided the plate of Bagnall 2037, a locomotive that had worked at Castle Firebrick Co Ltd in Flintshire; the choice of plate was influenced by Aidan's particular interest in Wales. The organisation of the photographic competition posed a number of problems, as it was the first we had undertaken; but they were overcome, with the help of our lady member, Mrs Audrey Peattie, in receiving the entries, and Lindsay McDougall, in finding a judge eminently qualified by his status as a professional photographer and railway enthusiast. There were approximately one hundred entries from twentynine members, and Mr John Burgess ARPS gave his judgment with speed, commented on the entries generally and gave us a number of tips that will help us to plan next year's competition more expeditiously. 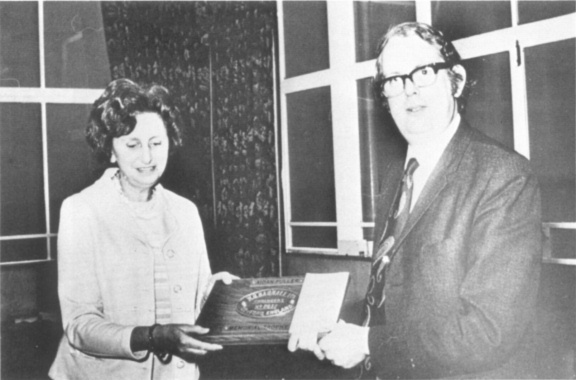 The first presentation took place, as hoped, after the formal business of the 1974 Annual General Meeting, when the Society was privileged to have Mrs Joan Fuller, widow of the late Chairman, to present the trophy and cheques to the winner and runners up. 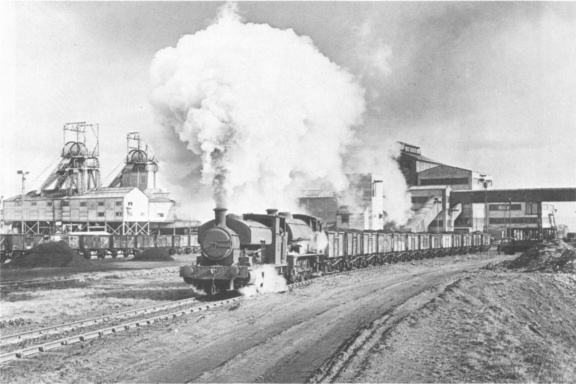 Mrs Fuller recalled her introduction to industrial railway enthusiasts when accompanying Aidan on trips in the early days; trips that often involved contact with the seamier side of industry, but which we accept as part of the scene. The entries-all in black and white on this first occasion-were displayed at the Meeting, and covered a wide variety of locations in this country and abroad; also locomotives of many types - steam, diesel, electric, standard and narrow gauge. Apparent too in many was an eye for "atmosphere". I think the entry was generally of a good standard considering this was the first year of the competition. Although some of the photographs were more "snapshots" than pictures there was a high proportion of very good technical and pictorial quality. First Prize M.J. Fox This is an excellent picture for both its technical and pictorial content. The locos are shown working hard and the atmosphere generated by the blasts of smoke from both engines adds a great deal. The line of coal wagons, the lorry on the right and the pit head gear on the left, all in good positions, are helped by the darkened sky to give impact. Another good feature is that the train has somewhere to go before it reaches the edge of the picture. 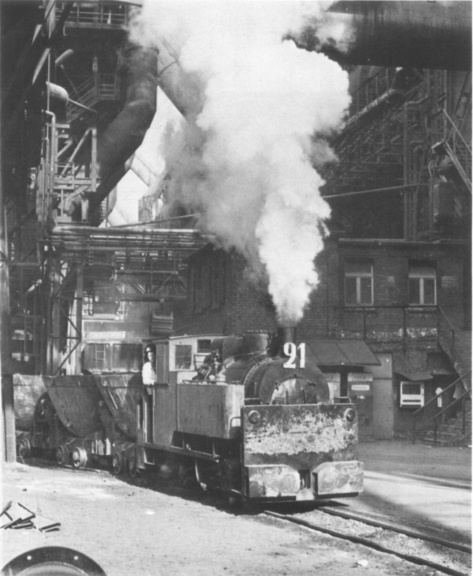 Second Prize B. Rumary Another working engine in somewhat different surroundings from the last, overshadowed by blast furnaces but nevertheless seen in ideal working conditions. The picture, like Mr Fox's, has an atmosphere which generates sound in the mind. Technically well exposed and well presented in a vertical format with dark buildings on all sides, holding our interest to the engine. Third Prize J.G. Tarrant This is more of a record picture but it is so well taken. The slight angle towards the front has given depth to the engine which also has sparkling detail throughout. 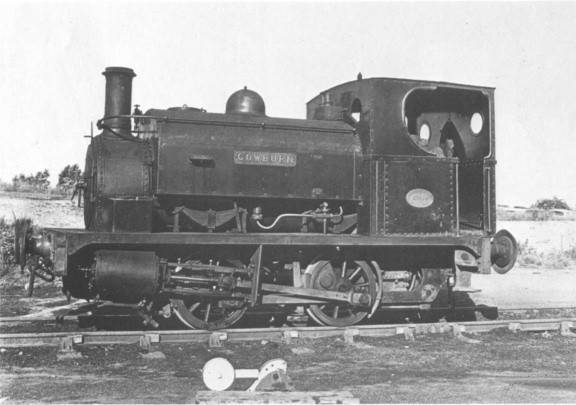 The stacked coal, the coat in the cab, the dirt on the brake shoe and the buckled buffers have given life to the engine and I hope show that COWBURN was still a willing worker.